Nearly every Harry Potter fan has indulged in a wistful fantasy of attending Hogwarts. Now, in Los Angeles, some of the series’ biggest fans can work for the famed school of magic. April 7th marked the opening of the Wizarding World of Harry Potter at Universal Studios Hollywood—the second American Hogwarts outpost, following the Orlando version that opened in 2010. Visitors can experience not only Potter-themed rides, but Potter-themed food and shopping (read: wands), all created to give the sense that you are actually inside the world of the books and movies. To make the experience as all-encompassing as possible, the parks employ a cast of performers and crew members to keep up the wizarding facade. 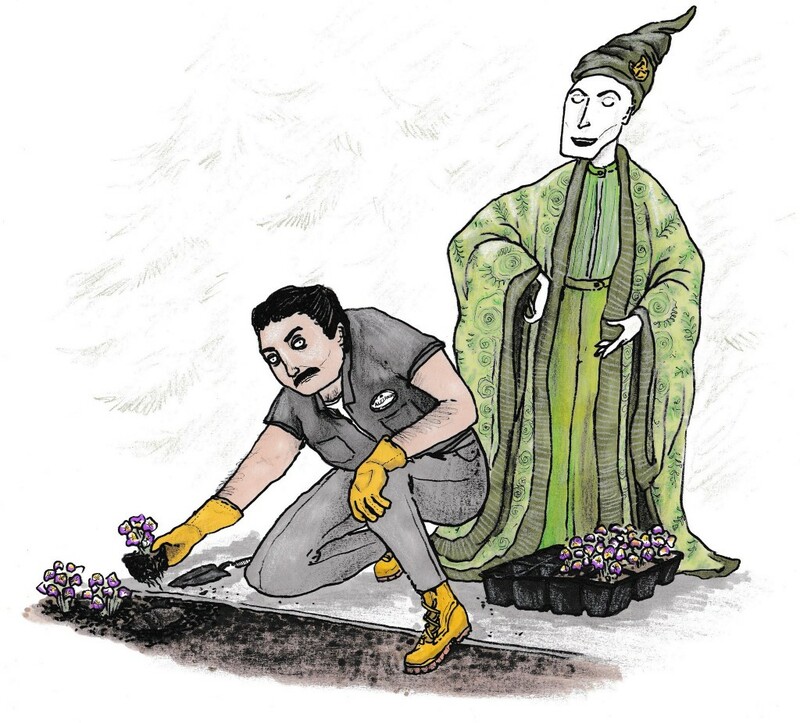 These workers must adhere to a number of specific rules and regulations to keep the magic flowing—including agreeing to not talk about it. 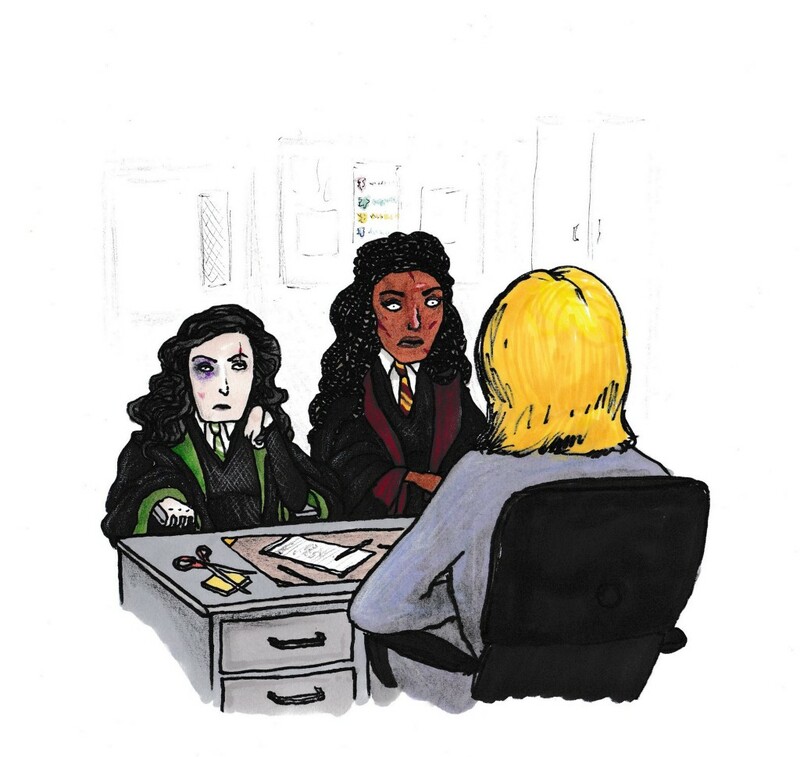 MEL managed to pry a few of fake-Hogwarts’ secrets from an anonymous employee in her mid-20s. How did the hiring process go? Did they ask you a lot of Potter-specific questions? I applied and it was about two hours later that I got an email to schedule an appointment to go in and meet [management]. [The interviewer] asked if I could name the four houses, and so I did. She asked, “If we were to ask you more Harry Potter trivia, would you be able to answer the questions?” I said, “Yes, absolutely.” And since it was clear I wasn’t lying, they passed me forward. I heard from other people that the ones that didn’t know much about Harry Potter were quizzed more. After you were hired, how did they get you ready to deal with guests who were huge fans? We did a week in the classrooms, learning about Universal Studios. They had a Harry Potter-specific training class, which went over key points and conversation starters if someone comes up wearing a Gryffindor sweater. We had two trainers, and they took turns going around so every single person would have to pick out some defining feature and start a conversation. They had different props they’d put on [like house scarves and hats]. The idea is everyone who works there is a witch or wizard in the Wizarding World, and you had to keep that character. Is the staff itself made up of dedicated Potter fans? When they asked questions about Harry Potter, I was very much a Hermione with my hand in the air. There were a surprising amount of us who were doing that, though. Usually I talk and talk and talk about Harry Potter and people listen because they’re my friends and they have to. But this time it’s people who were genuinely interested or had other viewpoints on it. 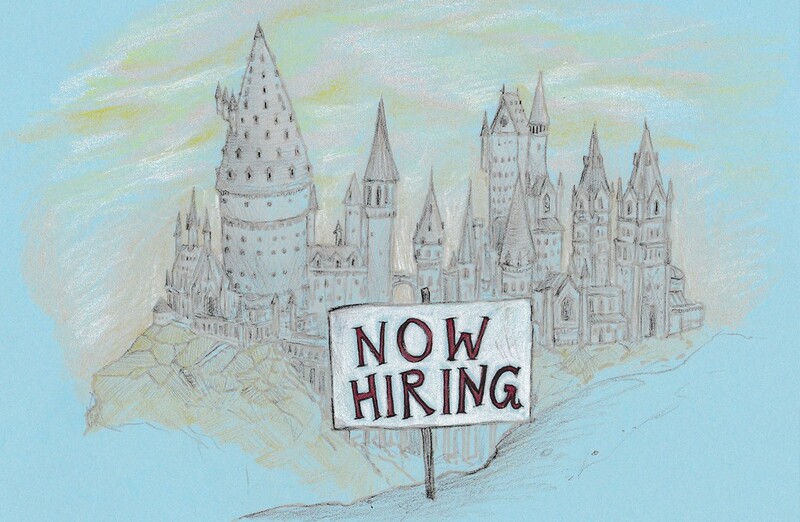 Does everyone working there have to be part of a particular Hogwarts house? If you don’t work at the castle or Filch’s Emporium (where they wear school robes as their uniform), you didn’t attend Hogwarts. If a guest were to come up to me and asked what house I was in, I couldn’t tell them. I have to tell them I didn’t go to Hogwarts, that I was homeschooled or I went to a school [they] don’t know. They don’t want us putting ourselves in the story. What happens if someone asks a specific question about Harry Potter or another fictional student? We can’t say that we know Harry Potter; we can’t say Luna Lovegood is our bestie. It depends on who the person is asking [about], but one of the common answers we’ll give if you ask about students is, “Oh, they’re probably up at Hogwarts doing their studies.” It’s always December-ish in Hogsmeade, so students are either doing their studies or at home. Do the workers at Hogwarts get to pick their house affiliation, or is it assigned to them? When the cast who work at Hogwarts show up for their shift, they can choose whatever house they want to be that day. I know a lot of them tend to stick with houses that they identify with. Does everyone on staff need to know how to cast every spell? The [spell windows where fans can use special wands to make “magic” happen] are managed by the same employees that do the Ollivander’s experience [where guests watch a magic show and then shop for their own wands]. It’s all one training. We had one week in the classroom, and then the next week there were no guests in the park so we walked around practicing all the windows. It’s really simple to get down, and there’s plaques on the ground. It’s really just making sure you have the pronunciation correctly — they’re Latin-core. Is everyone carrying wands at all times? The only people who have to carry wands on them are those who are helping at the windows. I think some people bring their personal wands. If you’re a student, the robes they wear come with wand pockets—that’s how the robes were made—so some people carry them there. What about accents? Do you have to fake a British one to work there? The only people who can do accents are the performers: the wand keepers, the conductors and the stage performers. For anyone else, it has to be your natural accent. If you actually do have a British accent you can use it. But if it’s not a natural one they prefer that you don’t. There’s snow on the buildings year-round, which is weird in Southern California. Where and when is Wizarding World set? It’s between the third and fourth books. We have a sign showing that Sirius Black has escaped from Azkaban and we have the Triwizard Tourney where the Durmstrang and Beauxbatons students come out. During the time period that our land takes place in, Voldemort has been defeated, but he hasn’t come back yet. People are still scared of the name. You’ll have guests that come up to you and ask, “Where’s Lord Voldemort?” You’re supposed to act scared and say you can’t say his name: he’s “He Who Must Not Be Named”. You have to figure out how to end the conversation and just move on. Can you ever break character? It gets difficult when we have to stay in that character, but guests who know the whole story try to bring up other stuff. You have to figure out with the guest that you’re talking to if it’s worth it to stay in your character and act like you don’t know what they’re talking about, or if you can drop the act and make their experience more worthwhile [by talking more in-depth about Potter]. Are people watching over you to make sure you do it right? Is there a secret shopper culture? Rae Votta covers the world of digital entertainment for The Daily Dot and writes the newsletter ReadySetGrowup for financial tips. She last wrote about what happens when you forget to pay your taxes for MEL.